Today we welcome a guest post by Kristina Jacobsen, author of The Sound of Navajo Country: Music, Language, and Diné Belonging. In this ethnography of Navajo (Diné) popular music culture, Kristina M. Jacobsen examines questions of Indigenous identity and performance by focusing on the surprising and vibrant Navajo country music scene. Through multiple first-person accounts, Jacobsen illuminates country music’s connections to the Indigenous politics of language and belonging, examining through the lens of music both the politics of difference and many internal distinctions Diné make among themselves and their fellow Navajo citizens. In the following post, Jacobsen takes us to a Navajo Nation flea market, where a range of cultural attachments are demonstrated by what people choose to sell or not sell. I recently went to one of my favorite places on the Navajo Nation, the Gallup (Na’nízhoozhí) flea market. Gallup is a “border town” bordering the Navajo Nation on the New Mexico side of the reservation, and the flea market represents a veritable smorgasbård of Diné and New Mexico Native and Hispanic arts, crafts, musical styles and traditional foods. Strolling through the makeshift lanes, it’s a fully immersive and sensebound experience, where anything and everything is for sale, and creativity is on full display: Blue corn kneel down bread (nsidigo’í) from Kaibito, neeshjízhii (roasted corn stew) with mutton, Navajo tea (ch’il ahwééhé or greenthread), red pork tamales served in chili water and wrapped in corn husk, and salted, toasted piñons in the shell are a few of the Diné specialty foods we drove two hours to find. There’s also oven bread from Acoma Pueblo, stunning in-lay jewelry from Santo Domingo and Zuni pueblos, Diné silver and turquoise jewelry, and, everywhere we walk, gospel, country and “peyote” music fills the air. There’s even a teenage busker, playing his original metal tunes about the “rez” and being Diné. Since the flea market is close to the main Navajo reservation, Diné representation in this scene is high (much higher than it is in Gallup at large), and so it becomes, in many ways, a Diné social space. People from the reservation and the Navajo diaspora come to visit with old friends, to speak Navajo, and to consume hard-to-find traditional foods, to be joyfully Diné, with one another, in a public space. What struck me this time after many months away overseas is the subtle ways that Diné cultural sovereignty is practiced in this informal economy, where unemployment on the Navajo Nation currently hovers above 50%, and where tribal citizens are incredibly creative about ways to make ends meet in order to live on or close to their ancestral homeland (a statement about sovereignty and connection to homeland in its own right). Although not an explicitly “political” space, Diné citizens express their attachments to being Diné through what they choose—or refuse—to sell in this public space. And food is one lens to see this through. 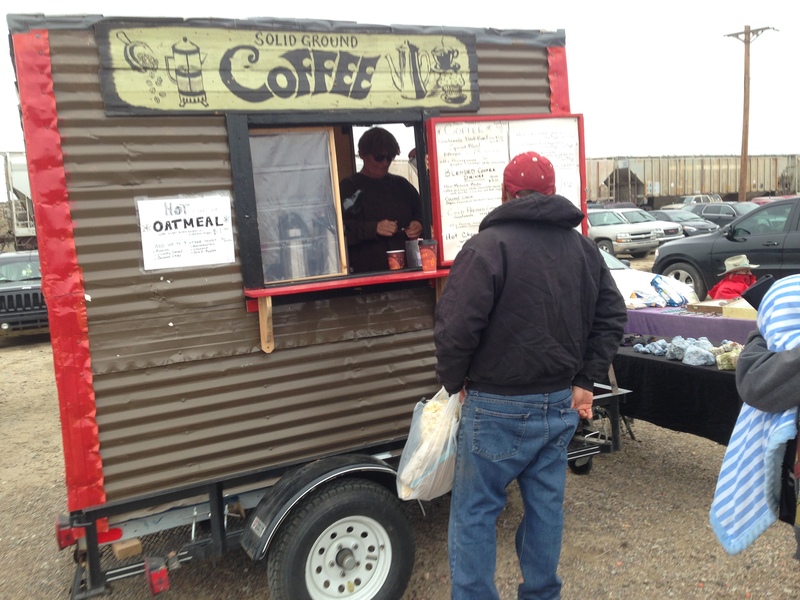 For example, while some vendors sell frybread, Navajo burgers (hamburgers wrapped in frybread) and pop, others choose to sell, for the same price but twice the amount of labor, unsweetened Navajo tea and corn-based traditional foods including kneel down bread, blue corn mush (tóshchíín) and neeshjízhii. (Neeshjízhii, for example, must be boiled overnight, so producing this on a mass scale is tremendously labor intensive). These decisions alone can be understood as responses to settler colonialism’s reach. On the one hand, Navajo frybread (a staple in various forms through Indian Country) is delicious, loved, and seen as a “traditional” food by many Diné, although it was introduced into Navajo diets around the time of Diné Removal known as the Long Walk, 1864-1868. It is the ultimate Diné comfort food. 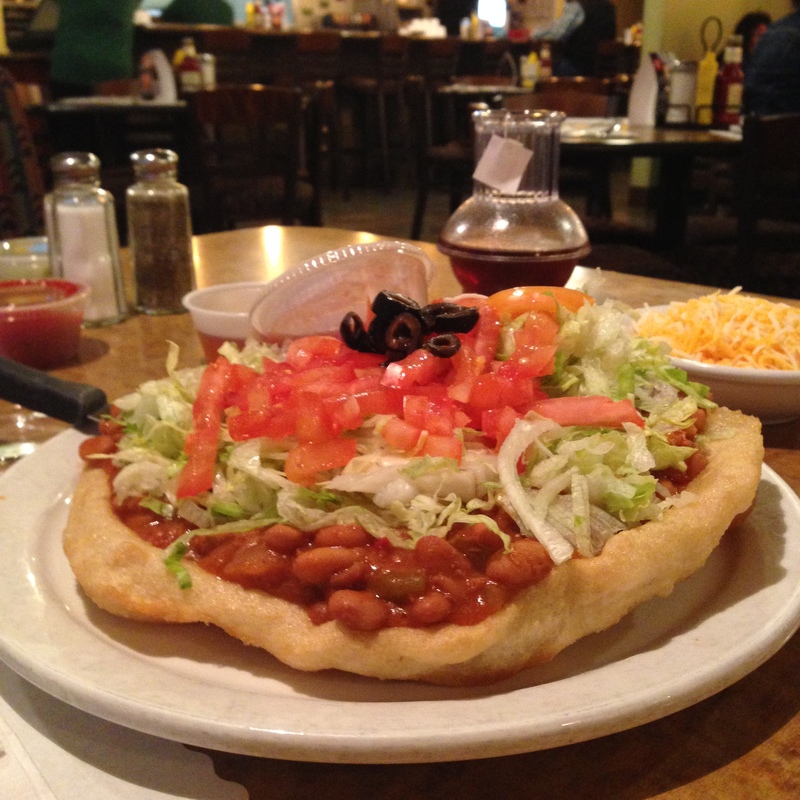 For others, frybread is connected to the skyrocketing number of Diné citizens struggling with Type II diabetes and to the U.S. colonial project of introducing white flour and lard into Diné diets. Refusing to sell pop or frybread, as many vendors do, and insisting on selling leaner, pre-colonial traditional foods, is a way to remind passersby that Diné foodways, culture, and cultural sovereignty are still vital, creative, and alive. Driving back to Many Farms, where I’m staying at a friend’s “sheep camp” on the top of an Arizona high desert mesa, we listen to honky tonk tunes playing from an AM radio station and I marvel at how, twenty years after I began my fieldwork on the reservation, country music is still the only genre you can field on the three available stations. Sleepy from neeshjízhii and cracking piñon shells with my teeth to stay alert, I think about how identity becomes solidified at the level of the senses—taste, touch, smell, sight, sound, kinesthesia—in profound and often visceral ways. How do we become who we say we are, and what makes us sure of it? How do we become a part of a place? Surely the flea market, and the thriving, informal economy that it represents with its swirl of sensory experience, plays a central part in that knowing. Kristina M. Jacobsen, author of The Sound of Navajo Country: Music, Language, and Diné Belonging, is assistant professor of music and anthropology (ethnology) at the University of New Mexico. She also cofacilitates the UNM honky-tonk ensemble, is a touring singer/songwriter, and fronts the all-girl honky-tonk band Merlettes.